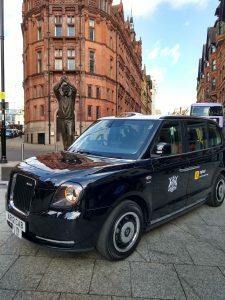 The first electric hackney cab to operate outside London has taken to the streets of Nottingham this week. The LEVC (London Electric Vehicle Company) TX model has been bought by Nottingham cabbie Amer Alam as part of a revolution that’s underway in Nottingham’s taxi ranks. 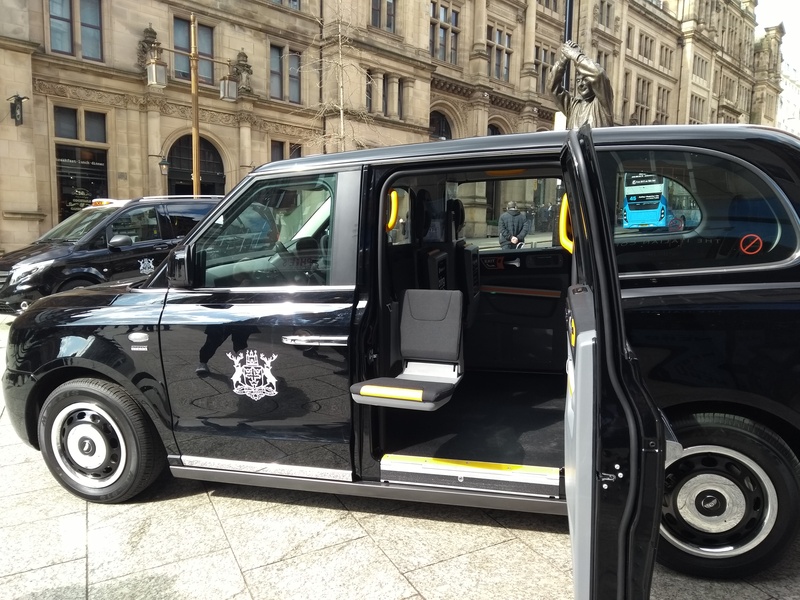 The City Council is behind a drive to bring the city’s taxi service into the 21st century and up to the standards of Nottingham’s world-class integrated public transport system. Low emission trams and buses are already playing their part in improving the city’s air quality – now the fleet of over 400 hackney cabs are set to become Ultra Low Emission Vehicles (ULEV) or Euro VI (cleanest diesel) by 2020 to help the city achieve air quality standards and support any potential Clean Air Zone. These vehicles offer drivers fuel cost savings of up to £100 a week and the TX model comes with a panoramic glass roof, wi-fi and USB charging points. 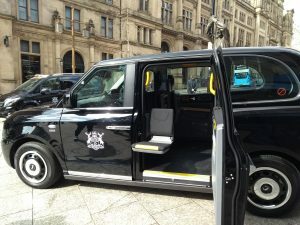 The livery of cabs is also changing from green to black-and-white, with local hackney passengers now also able to use the MyTaxi app – after Nottingham became the first city outside London to get the free smartphone app, which puts people just two taps away from a licensed taxi, and lets drivers get more passengers when they want them. The council itself will be placing orders for a small number of stylish new Ultra Low Emission Vehicle (ULEV) models to lease back to drivers, as well as investing £700,000 of Government funding into a network of electric charging points around the city. Portfolio Holder for Community and Customer Services, Councillor Toby Neal, said: “It’s great to welcome the first of hopefully many electric taxis to Nottingham. New low-emission taxis along with a user-friendly e-hailing app will bring our taxi service up to the high passenger and air quality standards as the rest of our superb transport system in Nottingham. · The TX, LEVC’s new taxi, combines the company’s expertise as a manufacturer of urban commercial vehicles with proven electric vehicle technology and the latest in advanced material manufacturing. · As well as the more premium feel, passengers will notice less vibration and noise in the passenger cabin, alongside charging points for mobile phones, Wi-fi and additional space for six passengers.